Hello ... Hello ... my old friends ... It's great to see you once again! Quill arrived in Shrewsbury at The Walker Theatre, Theatre Severn last night [Thursday 10th April] on the latest leg of their UK theatre tour to deliver another inspired and high quality live performance of their own Celtic tinged songs coupled with their unique take on classics by the likes of Thin Lizzy, Fleetwood Mac and The Eagles - amongst not a few others. But first, mention must needs be made of the excellent support set by Bridgnorth based Cooper & Davies. The acoustic duo, especially selected for the evening by Quill, delighted the enthusiastic audience with an impressive array of their own songs and a marvellous cover of The Everlys' "Bye Bye Love". Rob Cooper [Vocals/acoustic bass/hi-hat/harmonica/vocals] and Simon Davies [Vocals/guitar/bass drum] are clearly 'ones to watch' and their EP: "The Coach House Sessions" has an ELO connection too, as it features, is mastered by and produced by none other than Rob Groucutt. The outstanding aspect of last nights concert by Quill was that their show was not impaired by the recent double change in personnel. Most musical projects who see the departure of two established members and the arrival of new blood would expect them to take a little time to adjust and find their feet. But Quill are somewhat different. 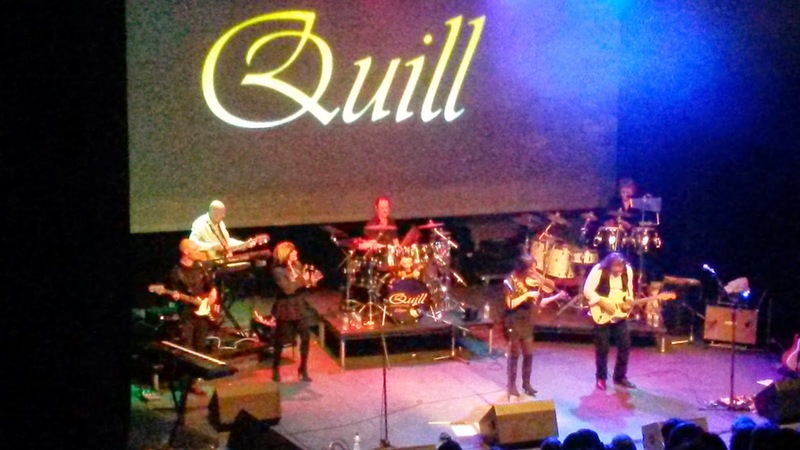 Paul Sargent and Christian Noakes were indeed missed but new recruits Tony Kelsey and Matt Davies managed to seamlessly weave themselves into tapestry of their new band whilst giving the new look Quill a new flavour. Joy Strachan-Brain was, as ever, charming with her superb vocals ably matched by her violin virtuoso and 'soul sister' Kate McWilliam. The classy drum work of Tim Tandler and the essential omni-talent of Dave Bailey sealed the deal. Last night, Quill were not better, they were transformed into a new phase. Mention must needs be also made of the contribution of Bev Bevan with these very special Quill collaborations. Down the years, Bev has received many accolades and nicknames including, of course, "Bullfrog Bevan" and "Basher Bevan". Bev's percussion contribution really was outstanding in the show and demonstrated another side of the legendary drummer's talent not previously appreciated. ELO Beatles Forever [ELOBF] recommends Quill to those enlightened folks who also like ELO, Jeff Lynne, Roy Wood, 'Brum Beat', The Idle Race, The Move, The Beatles and related artistes. Fragile X: Autumn UK Tour Debut Soon?